The Regiment was first formed in 1685 as The Earl of Bath's Regiment of Foot during the Monmouth Rebellion, when the 1st Duke of Monmouth attempted to overthrow the unpopular King James II. It was raised by John Granville, 1st Earl of Bath to support King James II however, Monmouth had been caught and beheaded by the time the Regiment was ready to take the field. Three years later when William of Orange landed in England in order to seize the throne from James II the Earl of Bath and his Regiment supported William of Orange (later King William III) and James II fled into exile in France. The Regiment went on to serve King William III in The Nine Years' War (1688–97) against the French and won their first battle honour at Steenkirk (1692). In 1751 the Regimental naming convention was simplified with all British Regiments assigned a ranked number of precedence (instead of naming after the present colonel) therefore the Regiment became the 10th Regiment of Foot. The Regiment went on to serve during the American Revolutionary War (1775–1783) fighting at the Battles of Lexington, Concord, Bunker Hill, the New York Campaign, Germantown, Monmouth and Rhode Island. Returning to England in 1778 after 19 years service overseas. In 1782 all British Regiments without Royal titles were awarded county titles in order to aid recruitment from that area and the 10th became the 10th (North Lincolnshire) Regiment of Foot. The Regiment went on to fight against the French in Egypt and Portugal during the French Revolutionary War (1792–1802) and the Peninsular War (1802-1814). It also served in India during the First Anglo-Sikh War (1845–1846) fighting at the Battle of Sobraon, the Second Anglo-Sikh War (1848–1849) and the Indian Rebellion of 1857. The Regiment also served in Japan from 1868-1871, protecting the small foreign community in Yokohama which maintained the only foreign trading port in Japan at the time. In 1881 the Childers Reforms restructured the British army infantry Regiments into a network of multi-battalion regiments each having two regular and two militia battalions. The 10th managed to avoid amalgamation with another Regiment but the number of precedence was dropped to become the Lincolnshire Regiment. The newly formed Regiment went on to serve in various foreign campaigns including; the Second Boer War 1899-1902 fighting at the Battle of Paardeberg and two World Wars. 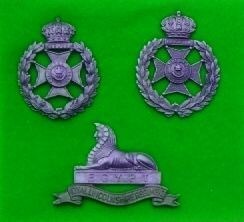 The Regiment was award the title ‘The Royal Lincolnshire Regiment’ in 1946 in recognition of outstanding service during World War II. However in 1960 it was amalgamated with the Northamptonshire Regiment to form the 2nd East Anglian Regiment (Duchess of Gloucester's Own Royal Lincolnshire and Northamptonshire). In 1964 it was further merged with The Royal Leicester Regiment, The Norfolk and Suffolk Regiments, the Bedfordshire and Hertfordshire Regiment and the Northampton Regiment to form the Royal Anglian Regiment. The Regiment raised a total of 19 battalions and was awarded 58 Battle honours and 3 Victoria Crosses but lost 8,800 men who died during the course of the war. The Battle of Mons and the subsequent retreat, The Battle of Le Cateau, The Battle of the Marne, The Battle of the Aisne, The Battles of La Bassee and Messines, First Battle of Ypres. Winter Operations 1914-15, The First and Second Attack on Bellewaarde, The Actions of Hooge. The German retreat to the Hindenburg Line, The First and Third Battles of the Scarpe, The Battle of Polygon Wood, The Battle of Broodseinde, The Second Battle of Passchendaele, The Cambrai Operations. 11.11.1918 Ended the war in France, Aymeries north of Aulnoye. 04.08.1914 Stationed in Bermuda at the outbreak of war and then moved to Halifax, Nova Scotia. 03.10.1914 Embarked for the UK landing at Devonport, Plymouth and then moved to Hursley Park, Winchester to join the 25th Brigade of the 8th Division. 04.02.1918 Transferred to the 62nd Brigade of the 21st Division. The Battle of St Quentin, The First and Second Battle of Bapaume, The Battle of Messines, The Second Battle of Kemmel, The Battle of the Aisne 1918, The Battle of Albert, The Battle of Epehy, The Battle of the St Quentin Canal, The Battle of Cambrai 1918, The Battle of the Selle. 04.08.1918 Stationed at Lincoln then moved to Grimsby and then Cork, Ireland in 1918. 04.08.1914 Stationed at Lincoln as part of the Lincoln & Leicester Brigade of the North Midland Division. 11.08.1914 Moved to Belper and then Luton. 07.01.1916 Embarked Alexandria from Marseilles. 31.01.1918 Transferred to the 177th Brigade of the 59th Division absorbing 2/4th Battalion and engaged in various actions including; The Battle of Bapaume, The Battle of Bailleul, The First Battle of Kemmel Ridge. 08.05.1918 Reduced to training cadre and transferred to the 49th Brigade of the 16th Division. 17.06.1918 Transferred to the 102nd Brigade of the 34th Division. 04.08.1918 Stationed at Grimsby as part of the Lincoln & Leicester Brigade of the North Midland Division. 13.09.1914 Formed in Lincoln and then moved to St. Albans to join the 177th Brigade of the 59th Division. April 1916 Moved to Dublin and Fermoy, Ireland. The pursuit of the German retreat to the Hindenburg Line, The Battle of the Menin Road Ridge, The Battle of Polygon Wood, The capture of Bourlon Wood. 31.01.1918 Absorbed by the 1/4th Battalion. 06.02.1915 Formed at Grimsby and then moved to St. Albans to join the 177th Brigade of the 59th Division. 08.05.1918 Reduced to training cadre then transferred to the 21st Brigade of the 30th Division. 31.07.1918 Absorbed by the 1/5th Battalion. 01.06.1915 & 17.04.1915 Formed at Lincoln and Grimsby. 01.09.1916 The 4th absorbed the 5th as part of the North Midland reserve Brigade. Aug 1914 Formed at Lincoln as part of the First New Army (K1) and then moved to Belton Park, Grantham as part of the 33rd Brigade of the 11th Division. 01.07.1915 Mobilised for war and embarked for Gallipoli from Liverpool via Alexandria and Mudros. 21.12.1915 Evacuated from Gallipoli due to heavy losses from combat, disease and serve weather. 02.02.1916 Moved to Alexandria to take over defences of the Suez Canal. 11.11.1918 Ended the war in Belgium near Aulnois north of Maubeuge. Sept 1914 Formed at Lincoln as part of the Second New Army (K2) and then moved to Wool as part of the 51st Brigade of the 17th Division. June 1915 Moved to Winchester. Actions of Spring 1916, The Battle of Albert, The Battle of Delville Wood. 11.11.1918 Ended the war in France, Aulnoye south of Maubeuge. Sept 1914 Formed at Lincoln as part of the Third New Army (K3) and then moved to Halton Park, Tring as part of the 21st Brigade of the 21st Division and then moved to Leighton Buzzard. April 1915 Moved back to Halton Park and then Witley. The First and Second Battles of the Scarpe, The Battle of Arleux, The Battle of Pilkem Ridge, The Battle of the Menin Road Ridge, The Battle of Polygon Wood, The Battle of Broodseinde, The Battle of Poelcapelle, The First Battle of Passchendaele. The Battle of the Ancre, The Battle of the Albert, The Battle of Havrincourt, The Battle of the Canal du Nord, The Battle of Cambrai, The pursuit to the Selle, The Battle of the Selle, The Battle of the Sambre. 11.11.1918 Ended the war in France, Neuville S.W. of Le Quesnoy. Nov 1914 Formed at Lincoln as a service battalion of the Fourth New Army (K4) in the 91st Brigade of the 30th Division. 10.04.1915 Formation became the 2nd Reserve battalion of the 3rd Reserve Brigade and moved to Lichfield and then Brocton. 01.09.1916 Became the 11th Training Reserve Battalion. 09.09.1914 Formed by the Mayor and Town of Grimsby and then moved to Brocklesby. June 1915 Moved to Ripon to join the 101st Brigade of the 34th Division. 10.08.1915 Taken over by the war office and moved to Perham Down and then Sutton Veny. 17.06.1918 Transferred to the 116th Brigade of the 39th Division. 20.09.1918 Transferred to the 197th Brigade to defend the lines of communication near Aumle. Oct 1915 Formed from the depot companies of the 10th Battalion at Lincoln as a reserve battalion. Jan 1916 Moved to Harrogate to join the 19th reserve brigade and then moved to Durham. 01.09.1916 Became the 82nd training Reserve Battalion of the 19th Reserve Brigade at Newcastle. July 1916 Formed at Brocklesby. Aug 1916 Moved to France to work on the Lines of Communication. April 1917 Transferred to the Labour Corps as the 16th and 17th Labour Corps. 01.01.1917 Formed in Bath from the 28th Provisional Battalion as part of the 215th Brigade of the 72nd Division then moved to Bedford. Sept 1915 Formed and went to India by Oct.
May 1916 Formed at North Coates, Grimsby. Aug 1917 Became the 4th Battalion Royal Defence Corps. There were four Lincolnshire Battalions during this war from 1939-1945. They fought from Norway and Iceland, to India and Burma. 1939: The Battalion was stationed in Dinapore, India. March 1942: First into action in India/Burma and was part of the 71 Brigade. 26th May 1940: Many of the Battalion were captured at Poperinge, near Dunkirk. 03 September 1939: The Battalion along with the 6th Battalion, were called up at once when the war was declared. April 1940: It was sent to Norway and was among the first Battalions to come into contact against an advancing enemy. It was soon evacuated due to Ill-equipped. 03 September 1939: The Battalion along with the 4th Battalion, were called up at once when the war was declared. April 1940: The Battalion embarked for France. Later it managed to return from Dunkirk. January 1943: The battalion left for Algiers. September 1943: It took part in the landings at Salerno in Italy. March 1944: It returned to Egypt. A lot of casualties and missing men had occurred by now. July 1944: It returned to Italy with further hard fighting. December 1944: It set sail for Greece to help the civil authorities to keep order. April 1945: The Battalion returned to Italy and then moved into Austria for occupation duties. I have a memories of a ’Tut Tut’ Clarke who used to cry when I played ’No place like home’ on my mouth organ. And Jack Crompton (in my pics) who sadly died recently. He remained a close friend after returning from service and was also best man at my wedding in 1955. Does anyone else remember these names or anyone who served with us please? I have a sad memory of a fellow soldier, I think was called Pete Marshall who I believe was from Gainsborough, accidently being shot during rifle practice. We were never told what happened to him wether he survived or not. Can anyone help with this information at all please? The Regimental Sergant Major (RSM Russell) was nicked-named Yedder, cos everything he shouted seemed to come out as "YEDDER".... Anyone else remember him?? I remember being collarred one day by CSM Flowers being told to add my name onto the MTS list. I didn’t have a lot of choice in this and had the rise took out of me for being caught by him. But I had the last laugh as when Jack had finished laughing and went out CSM Flowers was still there and caught him to sign up too!!! Did you ever get caught or have any memories of this or CSM Flowers?? Having signed up for the MTS (Motor Transport Services) I was obviously required to learn and take a driving test. On the day of the test it was snowing badly and blowing a blizzard but it went ahead. Well.. despite hitting a bus in that terrible weather I actually passed!!!! Do you have anymore driving memories? ?